5pc Egan Table set includes a unique style table exhibiting functionality paired with a modern design. Two Foldable Corn Husks Baskets and Two - 24" Saddle Seat Stools. The Egan Breakfast Table with Two Side Shelves utilizes its 36.16"H x 44.88"W x 19.69"D stature by including two vertically aligned platforms, the upper with 11.61"W x 15.75"D x 12.2"H of additional space, and the lower with 11.61"W x 15.75"D x 12"H. of additional space. Side rails guard two of the four sides offering easy accessibility along with content security. The slender, yet sturdy structural design paired with solid wood components results in reliable, natural beauty. Comes with Two Foldable Corn Husks baskets in chocolate finish opens to 11.02"W x 15.98"D x 7"H. The set also includes Two - 24" Saddle Seat Counter Stool with overall size of 17.48"W x 14.47"D x 24"H. Completed with a warm Antique Walnut Finish, The Egan Breakfast Table with Two Side Shelves will help to start any day. Assembly Required. 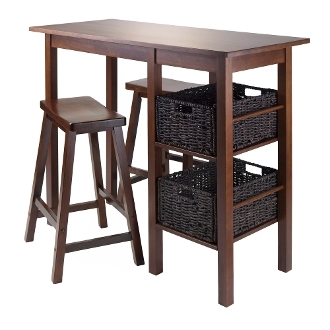 Includes 2 Assembled Counter Saddle Seat Stools 17.48"W x 14.47"D x 24"H; Seat dim. 17.48"W x 9"D.